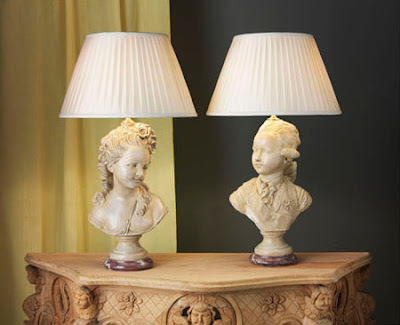 A finely carved pair of French, 19th century,lime washed, portrait, fruit wood busts as lamps.The subjects, Louis-Auguste, Dauphin of France andMarie Antoinette, Archduchess of Austria.Louis is shown as a handsome young man of 15.He wears a short, side curled, powdered wig,tied at the back of the neck with a large silk bow.At his throat is a tied linen cravat, or, stock, a stiffened neck cloth.Across his right shoulder he wears theSash of the Order of the Holy Spirit. The Order was worn suspended from asky blue, silk moire ribbon, Le Cordon Bleu,(children of the king being members of The Order from birth).On his left breast he wears The Badge of The Order,a gold Maltese cross with white borders,each of the eight points ending in a gold ballwith a gold fleur-de-lys between each of its arms.At the centre of the cross, is set a white dove descending.Marie Antoinette is shown as pretty, young bride of 14,her hair dressed with roses.Marie Antoinette was an Austrian Hapsburg Archduchessand roses were the symbol of her Austrian heritage.Recall her famous 1783 portrait, Marie Antoinette with the Rose,painted by Vigee Lebrun who painted 30 portraits of the Queen,most including her signature flower, the rose. 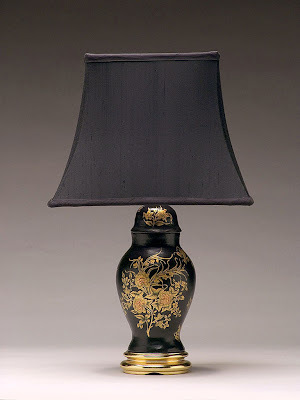 A striking, early 20th century, English black ground,papier mache, urn and domed cover as a table lamp.The black ground finely decorated in gold leaf workwith a large loose bouquet of summer flowers.The domed cover similarly decorated.A table lamp with a strong decorative statement. 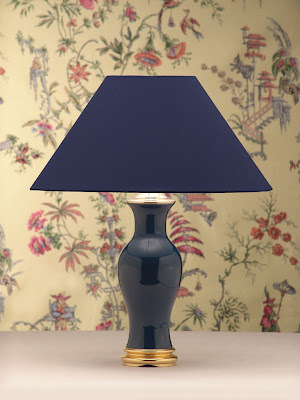 A most handsome, vintage, Chinese, baluster shaped table lamp.The monochrome lamp with a rich, dark blue glaze.The lamp on a turned maple wood stand, water gilded.A perfectly understated table lamp with an elegant look. 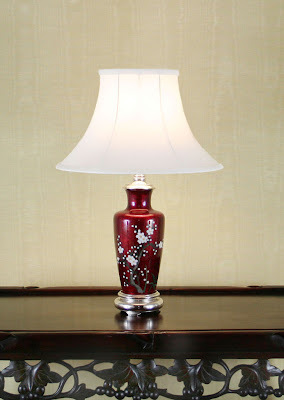 A small, vintage, Japanese, claret ground or Pigeons Blood,cloisonne, Ginbari, accent lamp.The claret ground decorated with a spray of flowering plum blossom.The lamp cap and stand of silver plated bronze. A rare, late 18th century, Leeds pottery, Pearlware,underglaze, transfer printed, baluster shaped, accent lamp.The lamp finely printed in dark blue in typical Leeds quality.The transfer printed subject, A Chinese Landscape,with island pagodas in a setting ofwaterways, lattice bridges, junks and Chinese houses.The lamp generously printed in full, front and backwith sides printed with narrow sections of the main print.The lamp with a bright pearlware glaze,undimmed by over 200 years!The lamp fitted with a custom made, gold plated bronze cap.The lamp standing on a custom made, polished maple wood base.Pearlware was the name given to this type of glaze,which had a small amount of cobalt addedwhich produced a bright, pearl-like lustre.The Leeds factory was established in 1771 inJack Lane in the village of Hunslett, near Leeds in Yorkshire.By 1775 it became noted for underglaze transfer printingand by 1790, Pearlware was introduced. 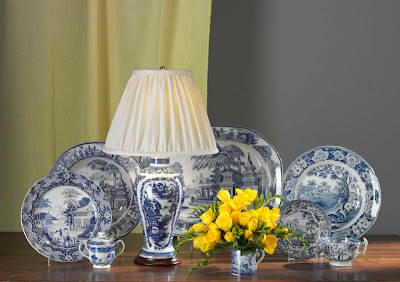 Antique & Vintage Table Lamp Co.
Their relationship with antique porcelain and pottery spans a period of 45 years. This includes 25 years as international specialist dealers, formerly known as "The Antique Porcelain Gallery", valuers to The Australian Incentive to the Arts Scheme and regular lecturers. Their long experience with antique ceramics and glass includes dealing with museums and the supply of pieces of national interest to the Prime Minister's Department. 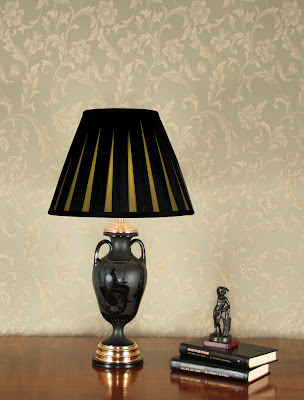 They have extended ceramics expertise into the quality bespoke table lamps seen on our site and are well known to interior decorators who have included many of our table lamps in minor to major projects. Included is a certificate of authenticity with each of our individually designed lamps, providing a full description, circa date and unconditional guarantee.